One of my weaknesses is bread! I enjoy looking for different types of bread recipes. Somewhere along the way I came across the idea of adding swiss chard to focaccia. I just don’t feel as guilty consuming so much bread when I am having something healthy along with it! This focaccia recipe is great as an appetizer and also perfect for lunch with a bowl of soup. It freezes well – it’s a handy side to have on hand since it is so versatile with meals. 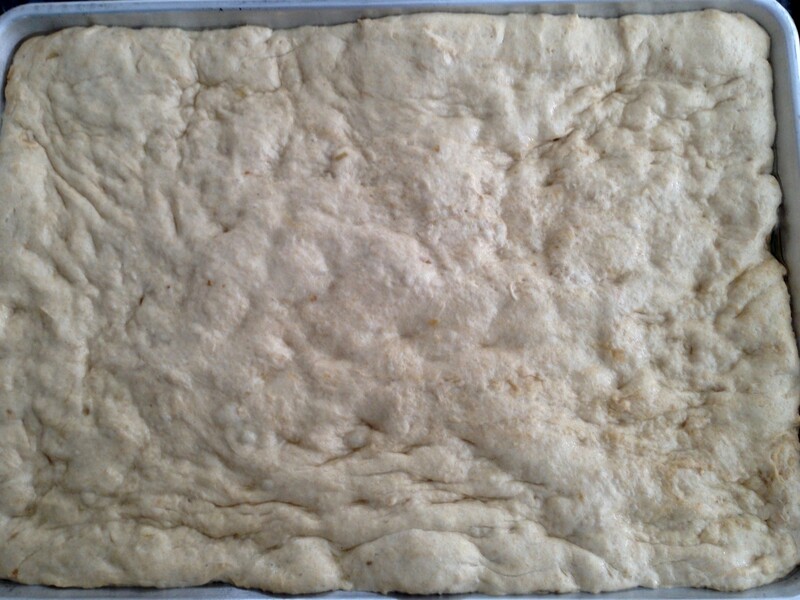 Best of all, the “No Knead Focaccia” recipe from the King Arthur Flour website is the simplest recipe I’ve come across since it doesn’t require kneading! I’ve adapted the recipe slightly below. Lightly grease a large cookie sheet with about 2 tablespoon oil. Combine all the ingredients for the dough in a large mixing bowl and beat at high speed with an electric mixer or 1 minute. The dough will be sticky. Scoop the dough onto the prepared cookie sheet and spread with a spatula or greased hands. 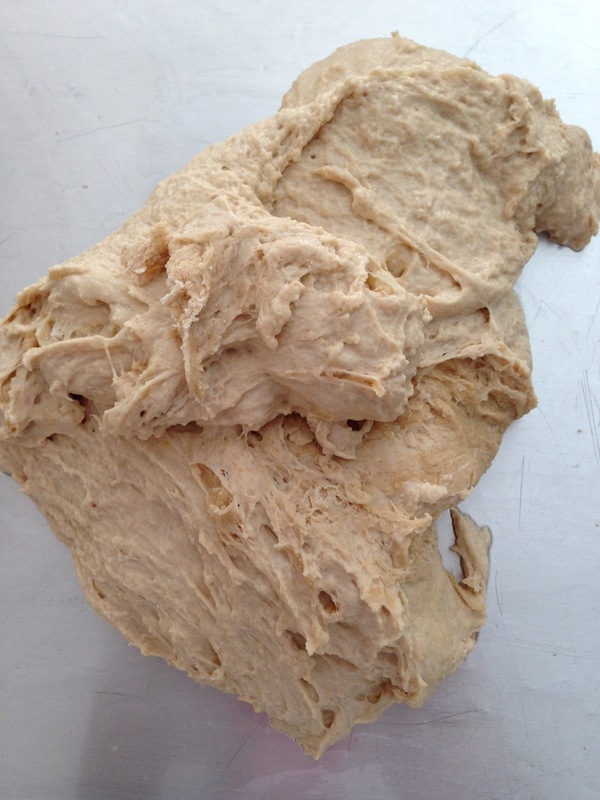 Let rise for about 45 – 60 minutes till the dough doubles. 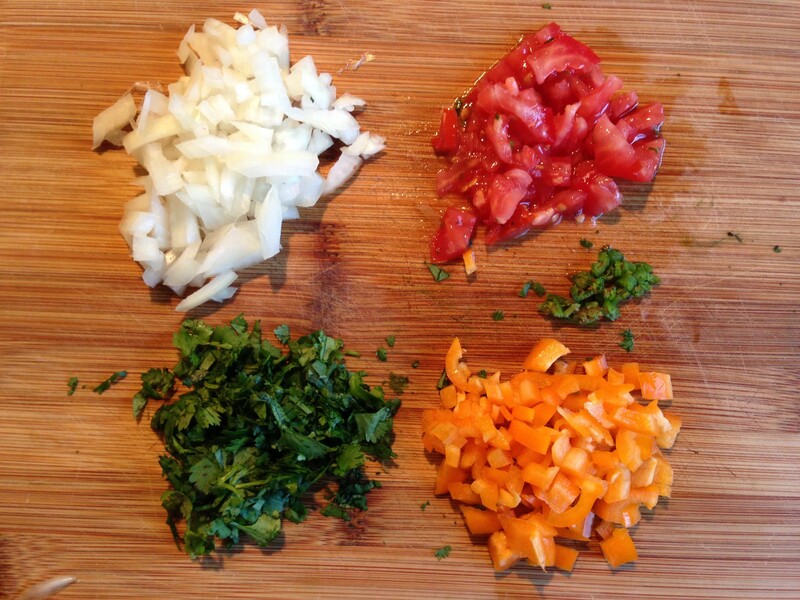 In the meantime, combine all the ingredients for the topping . 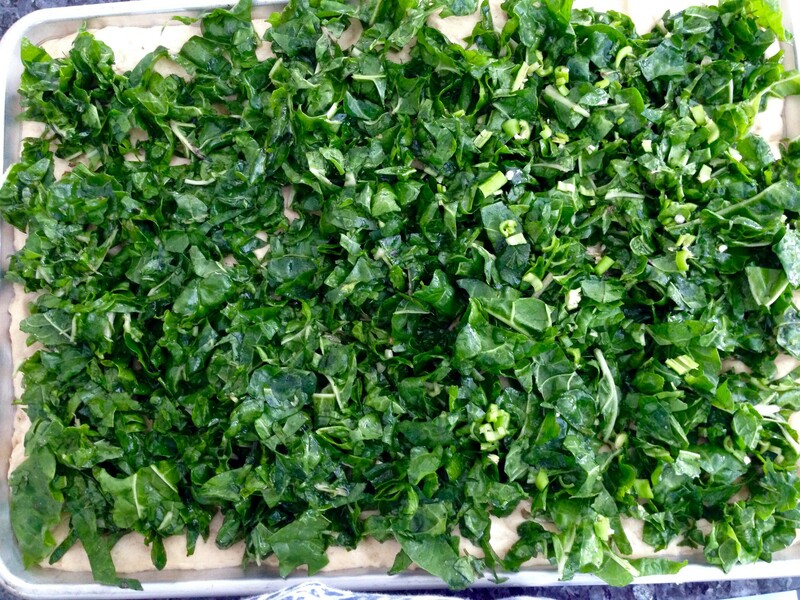 When the dough is risen, add the swiss chard to the dough and spread to cover the dough. Bake at 375 for about 20 – 25 minutes. Cool. Cut in squares. Podi gudu and puris were a typical breakfast of mine, growing up in Hyderabad. For obvious health reasons, puris (fried puffy bread) aren’t the most popular breakfast item any more, and even I don’t feel like making them often because they are fairly time-consuming! 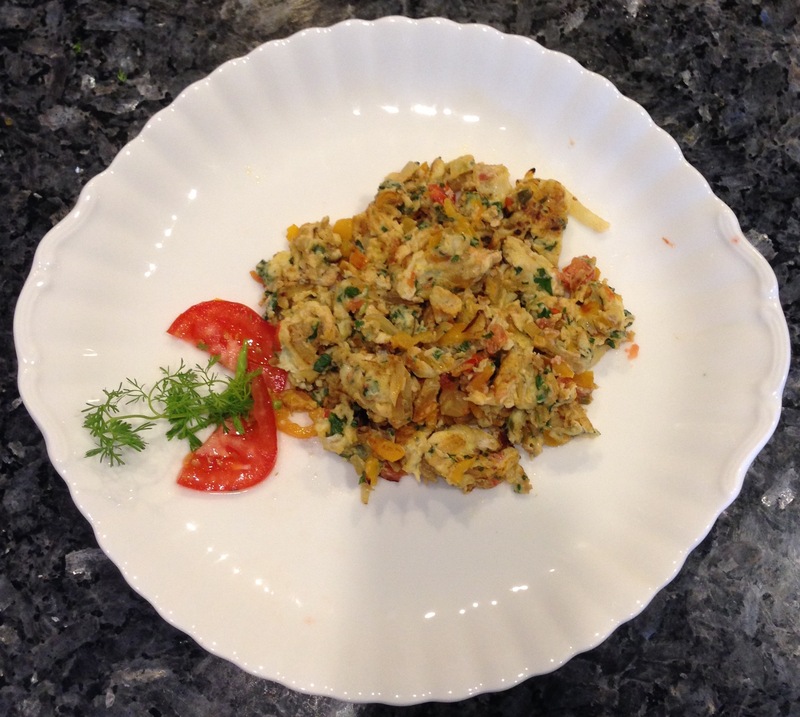 I’ve found though, that this flavorful scrambled egg dish is a great lunch item – as a wrap filling, using a chapati or tortilla- for us adults or kids. For those who do not eat eggs, using tofu is a great substitute. Heat oil in a small skillet. Add the onion and sauté for a couple of minutes until light brown. 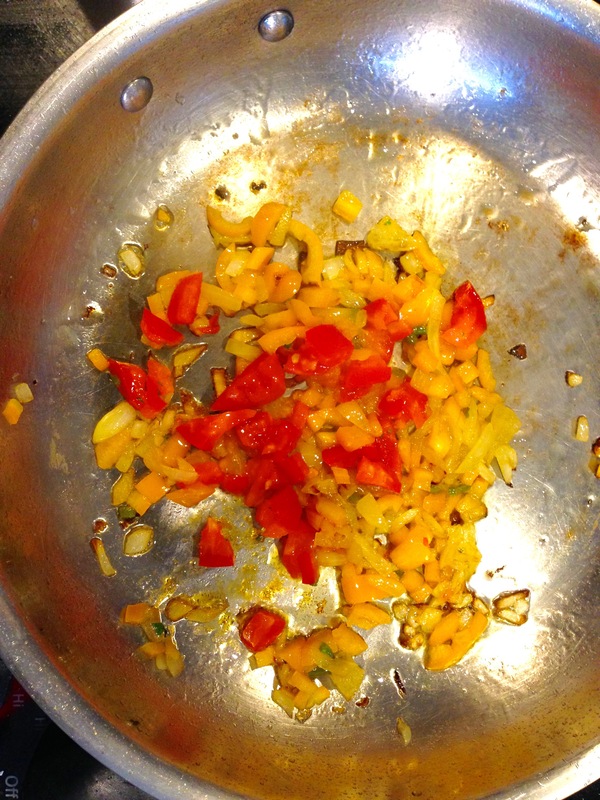 Add the bell pepper and continue to sauté for another few minutes or till soft. Add the tomatoes, green chillies and seasonings. Stir for 30 seconds and pour in the beaten egg or crumbled tofu. Cook on low heat for one minute. 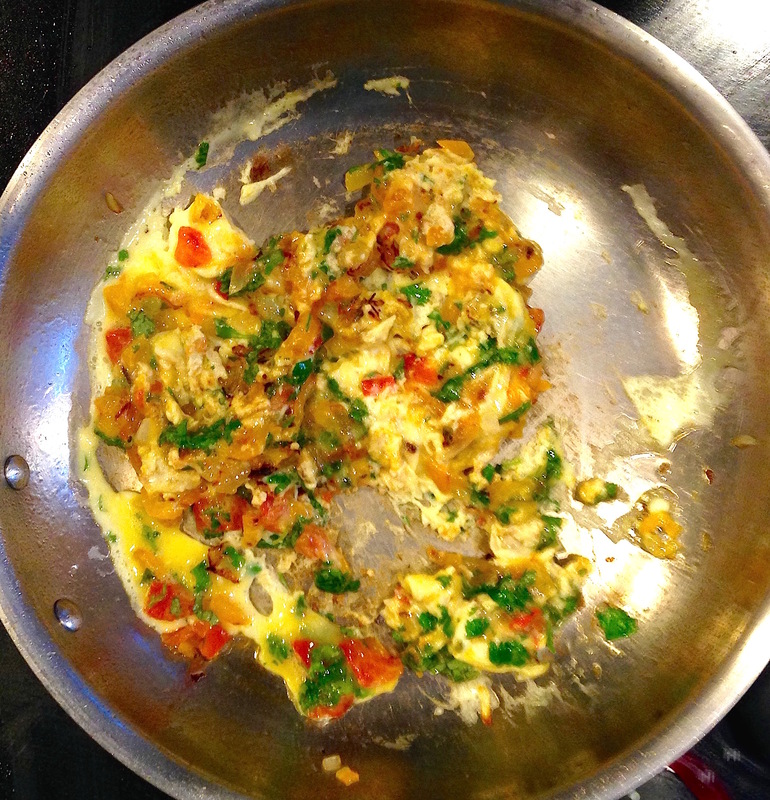 Stir until the eggs are set; add the cilantro and serve. On my recent trip to India, my sister in law told me that she had recently started cooking with Millet. She explained that it has nutritional benefits similar to Quinoa and some other grains but cheaper and easier to find. Millet is a drought tolerant plant which has been grown in many countries pretty easily whereas Quinoa is pricier because it is mainly grown only in the Andes region of South America. 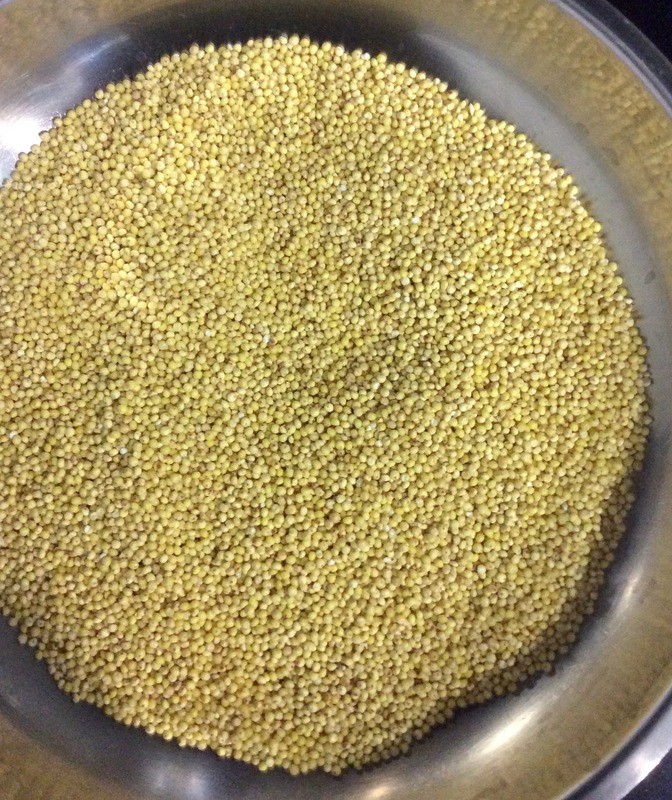 Although not a complete protein like Quinoa, it still has quite a high protein content. Millet is a leading staple grain of India – it is ground and used as a flour to make “rotis” (indian unleavened bread) and also eaten as “ragi” porridge. Though I remember as a child I was given this porridge and I did not like it at all! 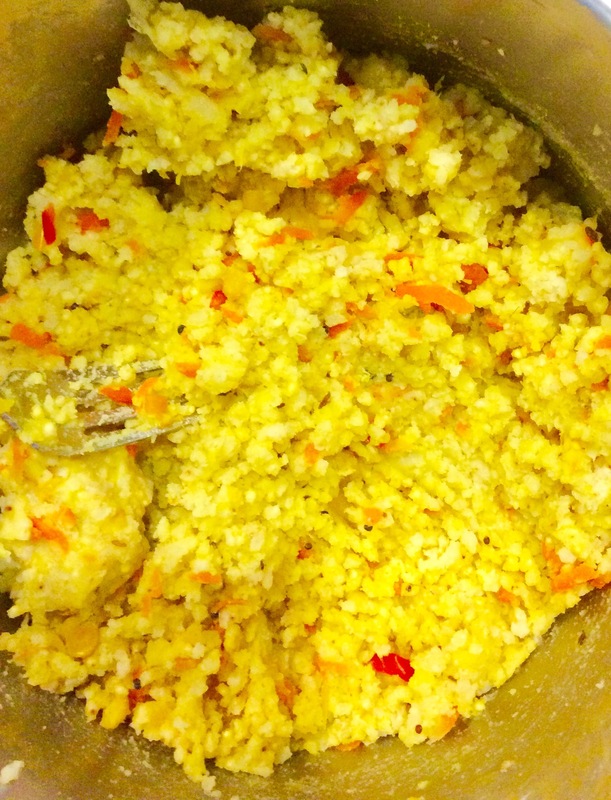 Substituting millet for rice was an easy way to start experimenting with recipes, so I used the hulled millet which was available at Whole Foods. I toasted the millet and cooked it like rice. Everyone seemed to eat it though the consensus was that they preferred rice. The next day I decided to do something different with the remaining cooked millet. After looking online at a few recipes for cutlets and croquettes, I decided to try making my own version combined with leftover vegetables which was a big hit! 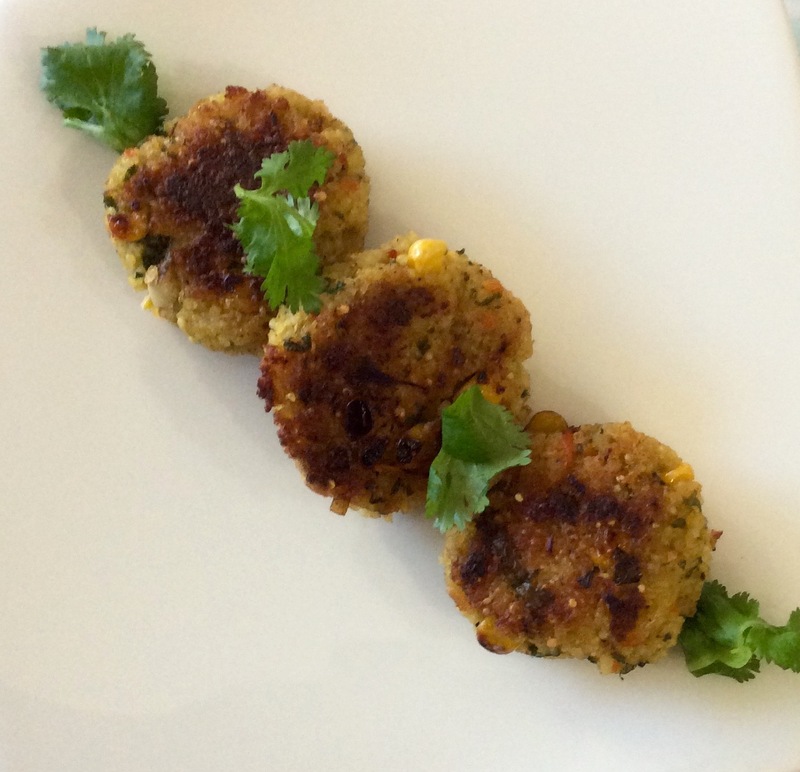 It seemed like the perfect grain for making these cutlets, perhaps because of the starch in the millet, egg or breadcrumbs aren’t needed to bind or coat the patties. 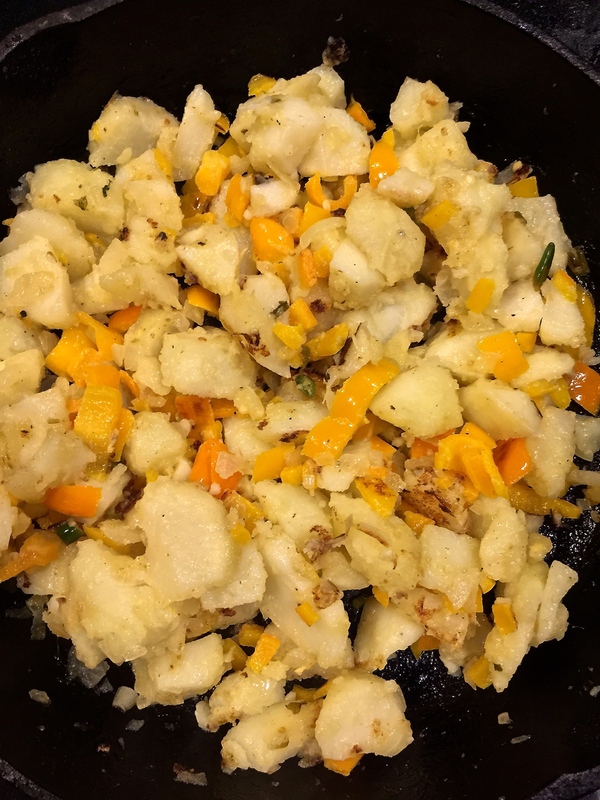 I used my favorite frying pan which is my cast iron pan – very little oil is needed and it is practically non stick. (I use my cast iron pan daily… to make pancakes, grilled cheese, chapatis or dosas to name a few!) The pan does take a little while to heat up – I usually turn it on to medium heat and then after 5-10 minutes or when it is hot, I turn the heat down to low. The patties turned out crisp using the cast iron skillet and I didn’t need to add much oil. Toast the millet in a skillet for 3-4 minutes till the millet starts to pop. Add the millet to a saucepan and add 2 1/2 cup water and the salt and bring to boil, simmer till the water is absorbed and the millet is cooked. Using a potato masher , mash the cooked millet. add the remains ingredients. Take about a 1/3 cup of the mixture, flatten into patties. 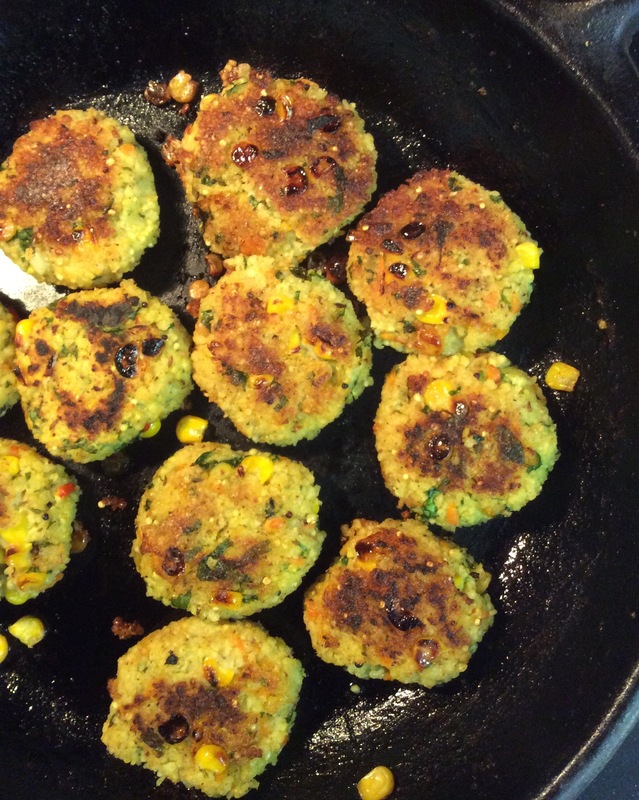 Heat a cast iron ( or non stick skillet ) and add 1 tablespoon oil to it and add the patties. Cook on low to medium heat, and cook on low heat for 5-8 minutes till the patties and brown and crisp.Serve immediately or keep warm in a warm oven . My very good friend from Spain introduced me to Swiss Chard. She told me she would buy it regularly, but the stores in Columbia didn’t carry it at the time. So, she asked one of them to stock it for her. 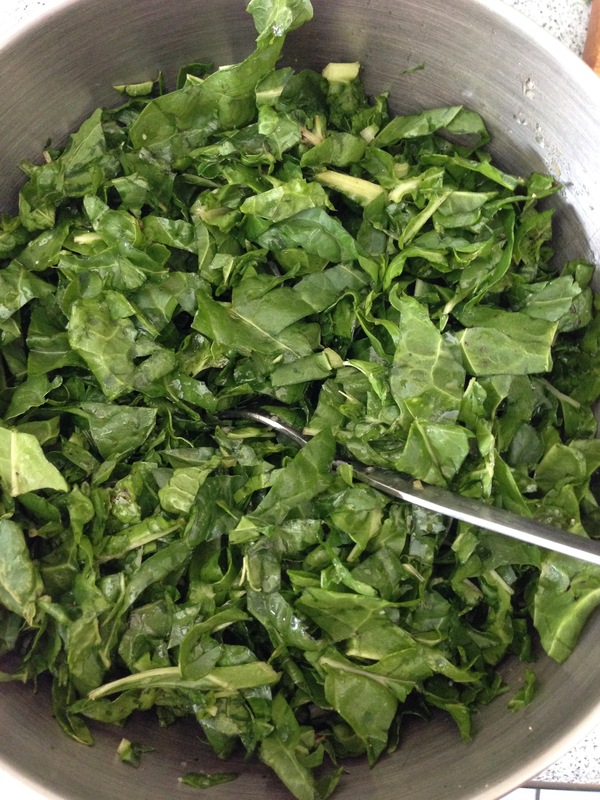 Now I know why; it is a delicious leafy green vegetable which is full of antioxidants, Vitamin K, and Calcium. It’s easy to digest and all of the nutrition is great for bone health! The first time I made it I combined it with baby spinach because I had some left over from a previous meal. 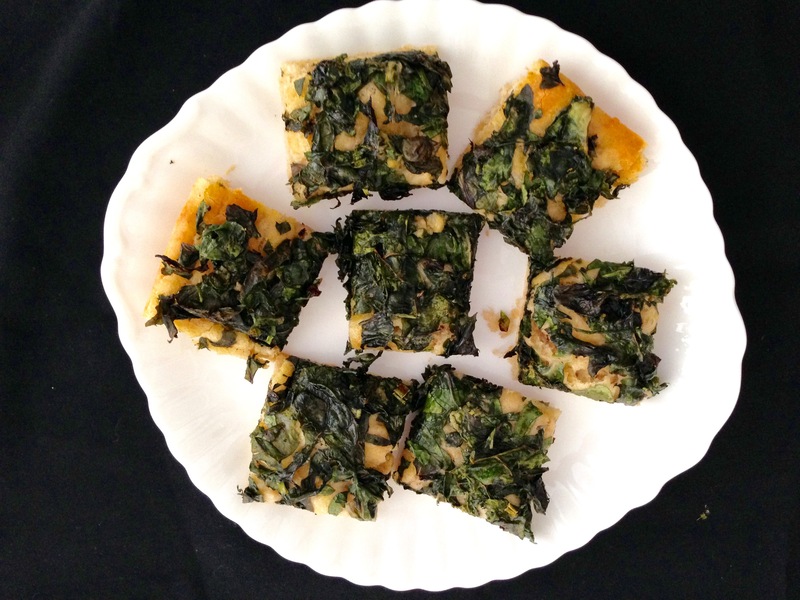 It cooks quickly and is easy to make – Swiss Chard has become a frequent guest at our table. 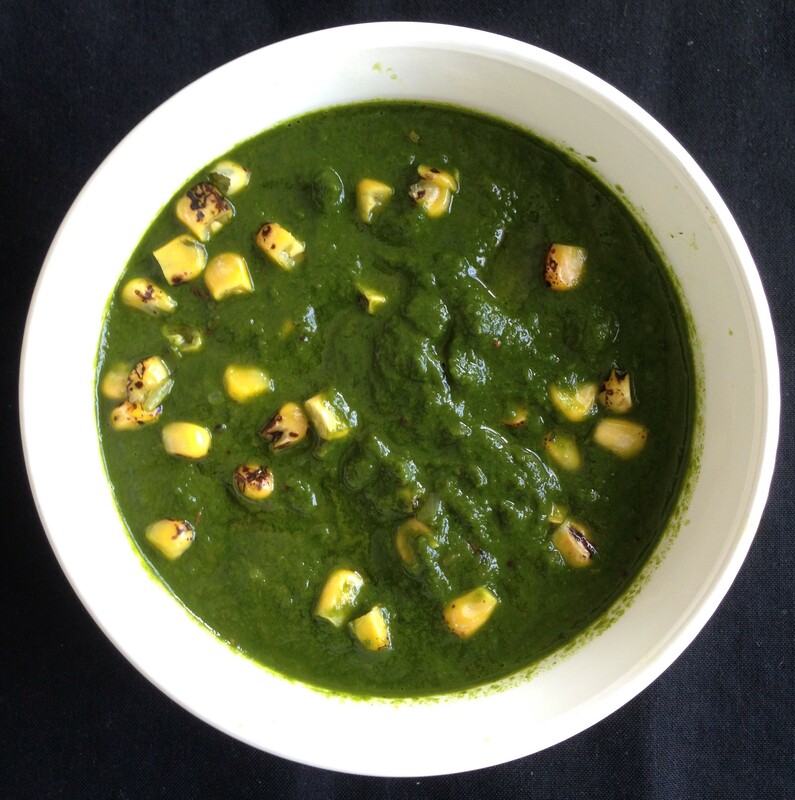 Instead of corn, you could add Paneer (Indian cottage cheese), tofu cubes, or mushrooms! Put a large pot of water on high heat. When it starts boiling, add the swiss chard and cook for about 3 minutes. Add the spinach and cook for an additional 30 seconds. Drain, saving about 1/2 cup of the water. Blend the greens with this water until smooth. 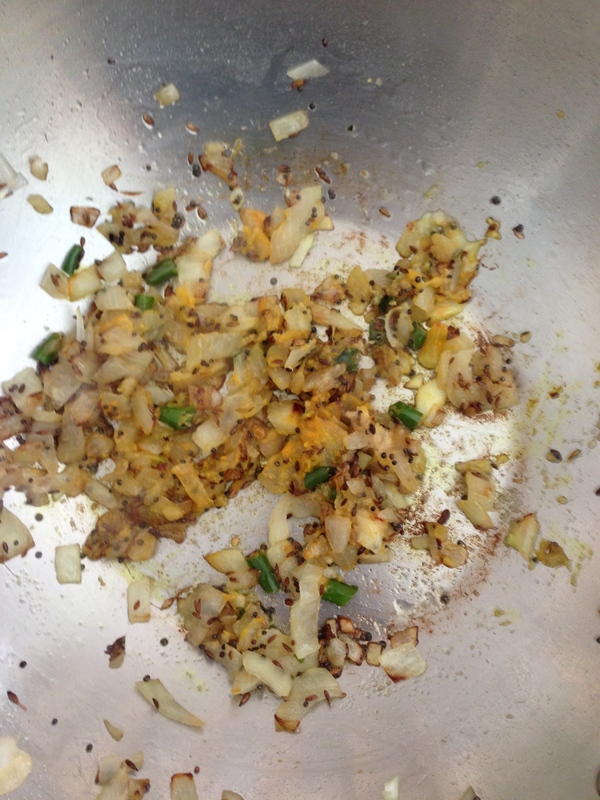 Heat oil in the same pan; add the mustard seeds and cumin seeds. Stir for 1 minute till the mustard seeds start to pop. Add the onion and green chilies and cook until the onions become light brown in color. Add the blended greens , salt and turmeric; stir for 2 minutes. Add the corn; simmer for a few minutes until done. Many years ago we were invited to our Venezuelan friend’s house for dinner. Much to our surprise, the main course was Calamari. Since we’re not the most adventurous eaters and I don’t eat seafood, it was a very awkward moment! They were, however, most gracious – the quickest item our hostess could come up with was Tortilla Espanola, probably the most common dish served in Spain. 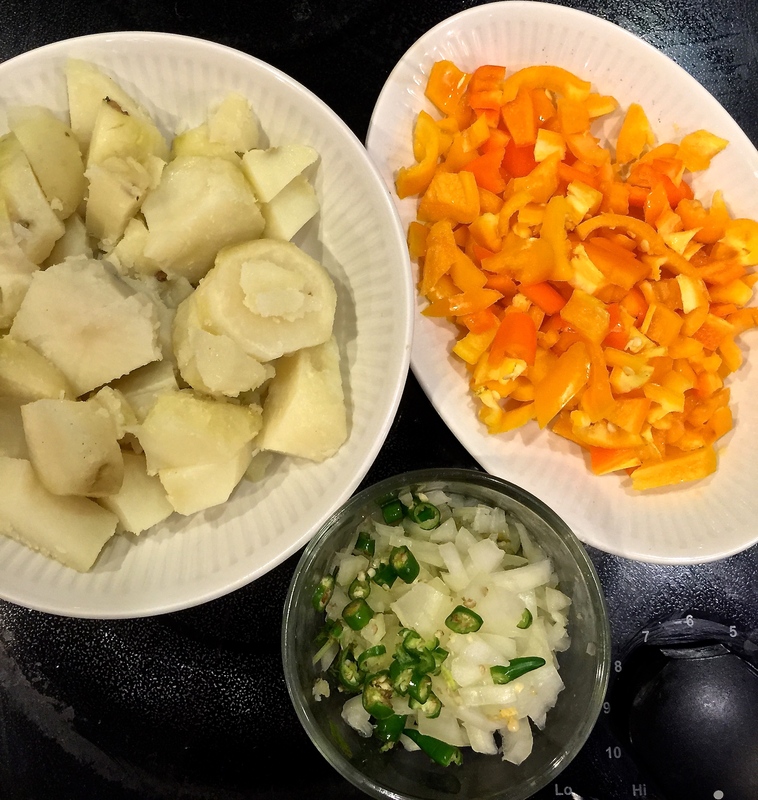 Needless to say, the “Indianized” tortilla became one of our favorite one-dish meals. Sometimes I make a quick potato omelet with a salad for lunch or dinner. Its also a great meal to use up left over vegetables, versatile so you can serve it as a hot meal, or as a room temperature “tapa” as they do in Spain. Notes: I prefer to use cooked potatoes as it uses less oil than if you have to saute the raw potatoes prior to making the omelet. Sometimes I boil a few potatoes with the skin on and store them this way in the refrigerator for a few days and use them in various dishes as needed. Heat 1 tablespoon oil in a medium size cast iron skillet (or any other skillet). Add the onions and saute for about 3 minutes until soft. 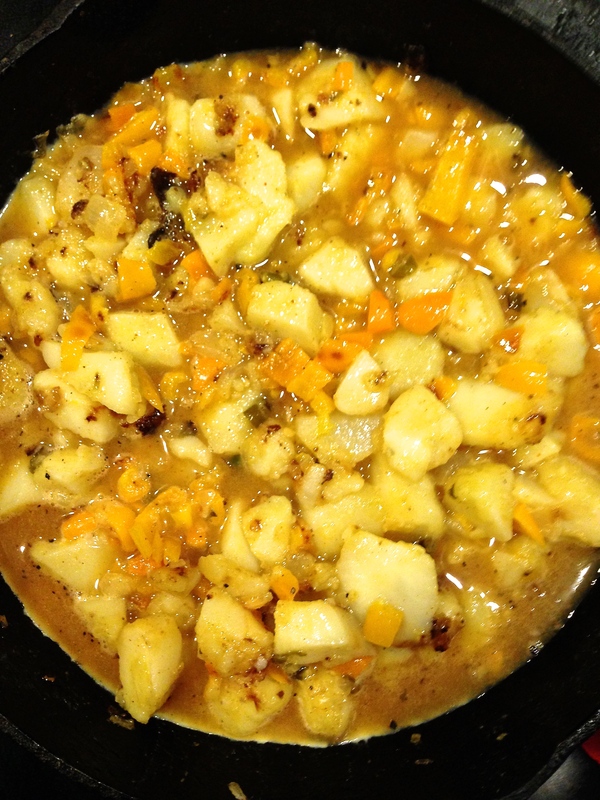 Add the potatoes, bell peppers and spices and continue to stir for another 3-4 minutes. 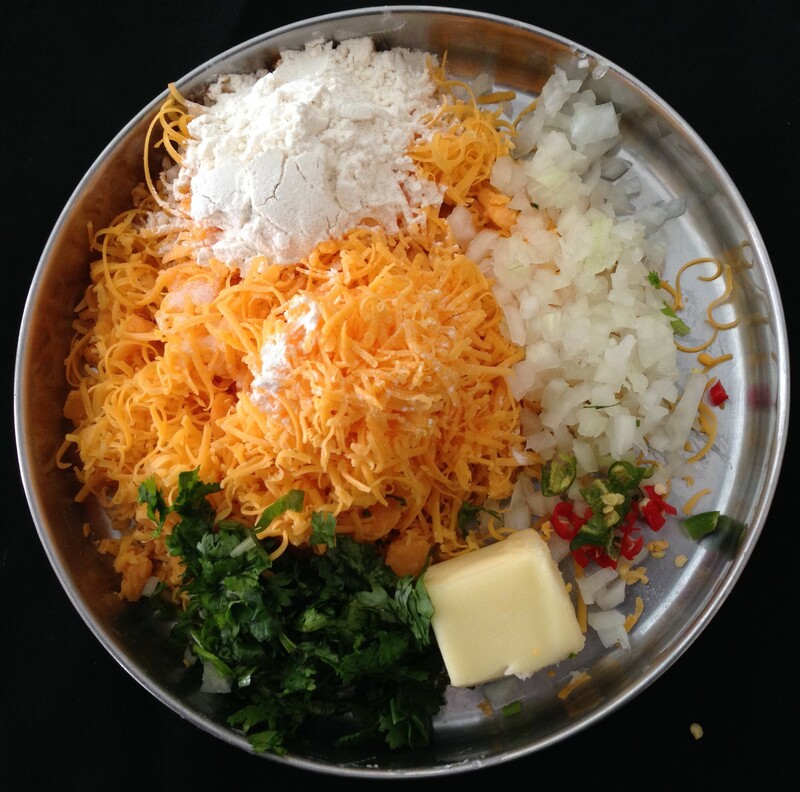 Add this mixture to the bowl of beaten eggs along with the cilantro. Wipe the skillet and add a tablespoon of oil, and pour the egg mixture back into the skillet. Cook on low till the eggs are nearly set. Take a large plate, cover the skillet and turn the eggs on to the plate. Add a tablespoon oil in the skillet and slide the egg back into the skillet. Continue to cook the omelet for about 3-4 minutes. Growing up in India, Chilli Cheese Toast was served often at “tea time”, when we would have a snack along with a cup of hot tea at about 4 o’clock in the afternoon. 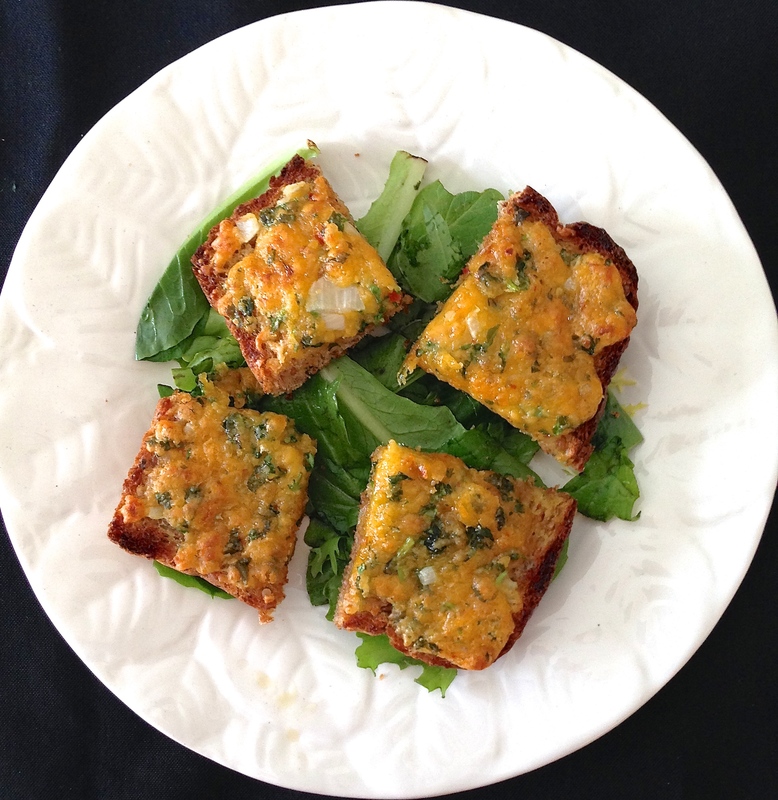 Cheese toasts originally were deep-fried – needless to say they were delicious! No one thought about calories back then or about all that fat we were consuming! As time went by, a healthier version was created – lighter but as flavorful and quick to prepare. The toasts are perfect for lunch on a cold day along with a salad or soup, or served as an appetizer. Place the bread in the oven, on broil, to brown one side of the bread. Mix the remaining ingredients to a smooth paste. 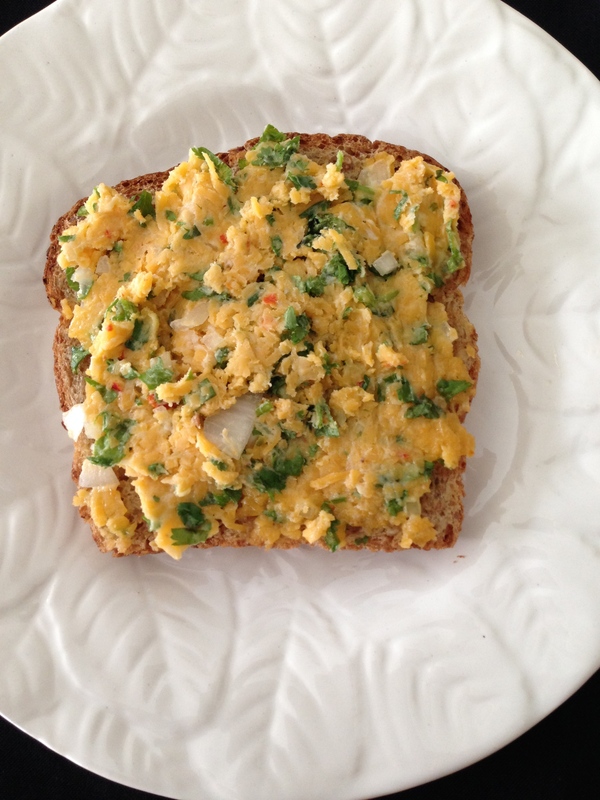 Apply the cheese spread to the side of the bread which was not toasted. Place under the broiler until light brown. Cut into quarters or in half.